Only applies to TradeLog 1500 and TradeLog (unlimted records) which inlcude MTM functions. Individuals must qualify for trader status by IRS rules and then elect mark-to-market accounting method based on federal procedures. We strongly recommend consulting with a CPA and/or trader tax expert in electing MTM. To learn more see our Online Tax Topics for more information. Create a New Data File, or Add a New Account to an existing data file. The Account Setup dialog will appear - see step 1 of Getting Started Guide. Give a unique descriptive Account Name for the account. If you used MTM accounting for the previous tax year, but did not use TradeLog, then check the box next to Did you use MTM last year? 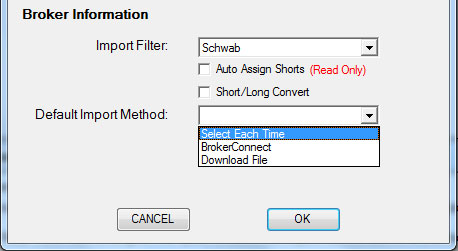 For Broker Information select the appropriate broker from the Import Filter drop down. Then select the Default Import Method. If BrokerConnect is available this is the recommended import method. Click OK to setup the account. 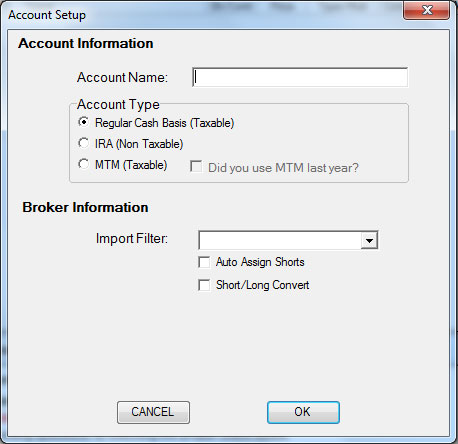 - This is your first year using MTM accounting for this account. - You used MTM accounting method in the prior year for this account.